‘Roses’ is a short film (unfinished) starring Tiffany Haynes and directed by Nic Loven. 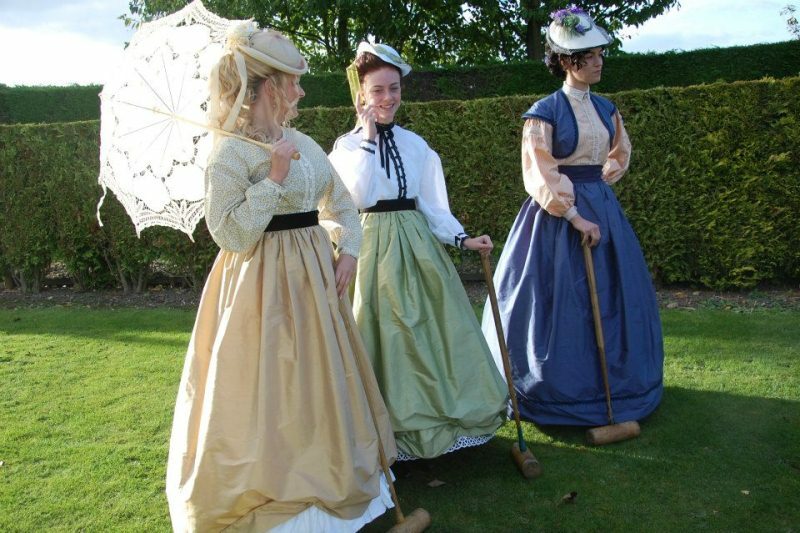 In August I was approached by a BBC antiques programme, being filmed locally, to supply actresses in Victorian costumes (pictured below) to play a game of croquet on the lawn of the house where they were filming. In the end the shoot didn’t go ahead, but the idea had whetted our appetites! 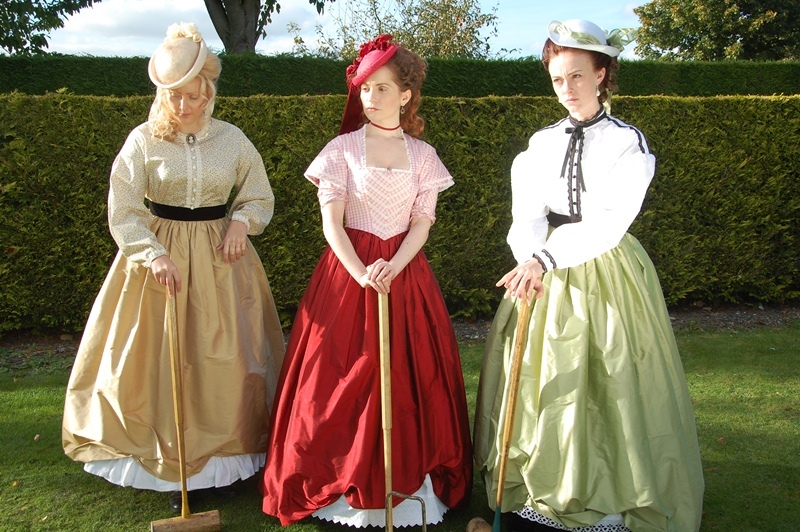 One of the actresses, Tiffany Haynes, came up with the amusing idea of re-shooting some of the scenes from the 1980’s cult movie, ‘Heathers’, which included a croquet game with each of the players colour-matched with the ball they were playing (red, green, yellow and blue). Renamed ‘Roses’ and with a cute little script written by Dougie Blaxland we were ready to play. However, there was no budget. This meant that costume had to be worked from stock, both from the fabric store and from the wardrobe. 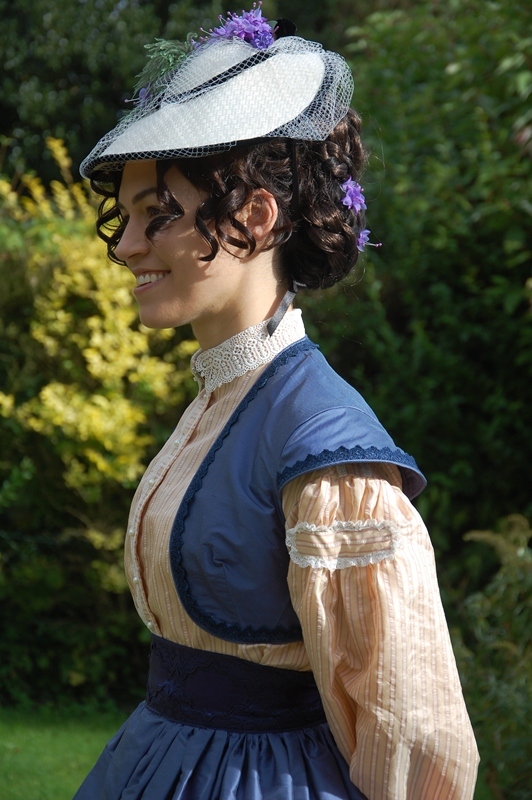 I had all the foundation garments (shifts, corsets, chemises, petticoats and crinolines) and I had already put together two outfits for the BBC (though only one dress would suit the new casting). 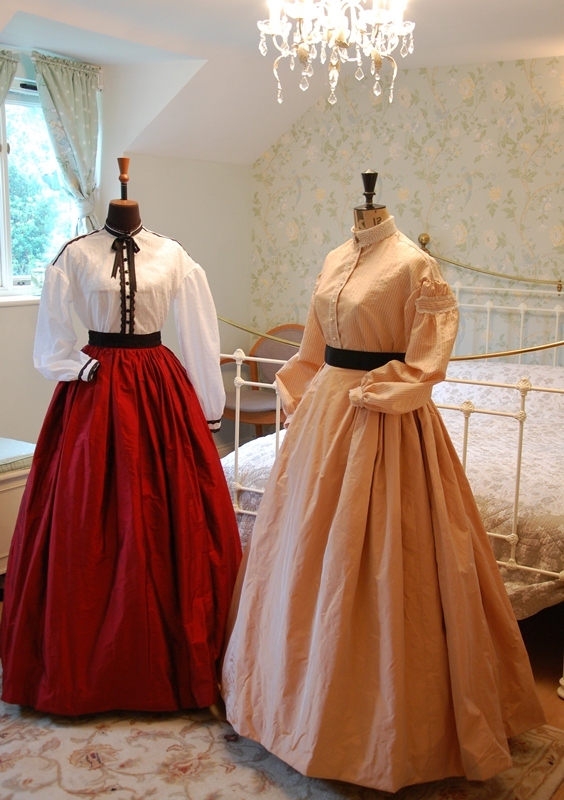 There was the added complication of the colour coding of the gowns, and one of the gowns, being peach-coloured, wouldn’t work at all, and so all four sets of costumes had to be re-thought through. Fortunately I had red, green (though not the classic colour of the green croquet ball which is a jade/turquoise shade), yellow and blue silk in stock! 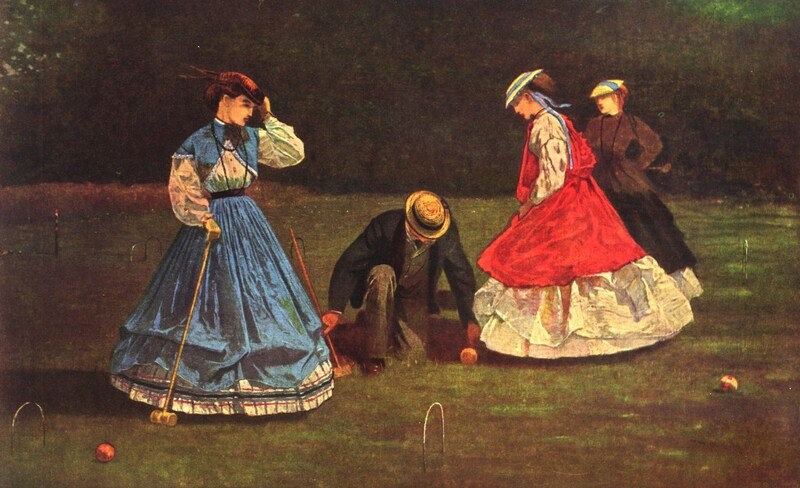 ‘Roses’ was to be set in the early 1860’s and my principal reference was the croquet paintings by the American artist Winslow Homer. 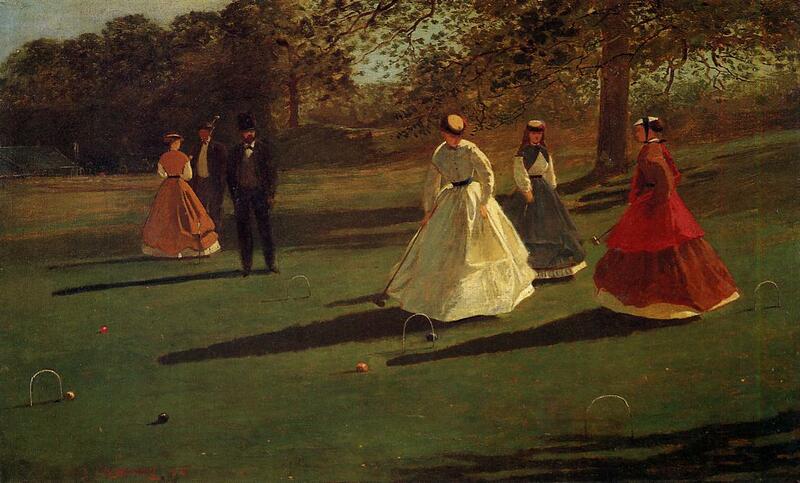 There is even a suggestion from these paintings that the women had indeed colour-coded their dress to the ball they were playing. Whether this was a stylistic interpretation by Homer or a trend he was reflecting, I don’t know. In the Homer paintings the women were wearing blouses or shirt-waists (just coming into fashion for the first time and introduced around 1861 – the same time as croquet was first introduced in England) in the garibaldi style, sashes or Swiss belts, and one was wearing a bolero. 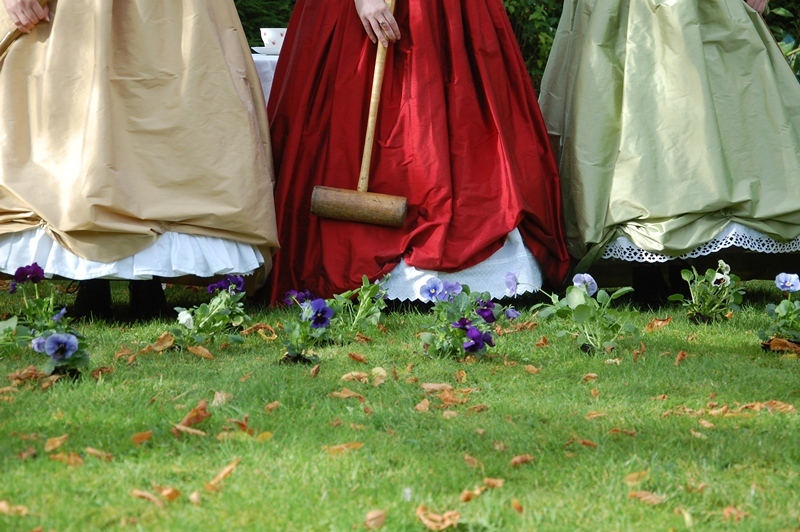 The hems of their skirts were pinned up to the crinoline to allow the players to see their feet and to avoid the skirt hems dipping onto the ground as they leant forward to play. However, Tiffany, who was to play Rose Red, wanted her gown to reflect the aggressively flirtatious nature of the lead character. 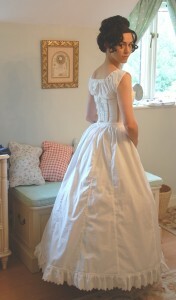 She was particularly inspired by a gown, worn while playing croquet, by a character from the film Vampire Diaries. It was a gown that broke the rules for day wear (bare arms and décolletage on display) and prefigured fashion trends to come. It seemed appropriate for the character, but rather than copy the gown exactly, I paid homage to it in the styling. As this was an unfunded project, fitting in a day for filming when cast, crew and locations were available meant that we had to fim in October rather than in the summer as we intended, but we were blessed with a gloriously sunny day. 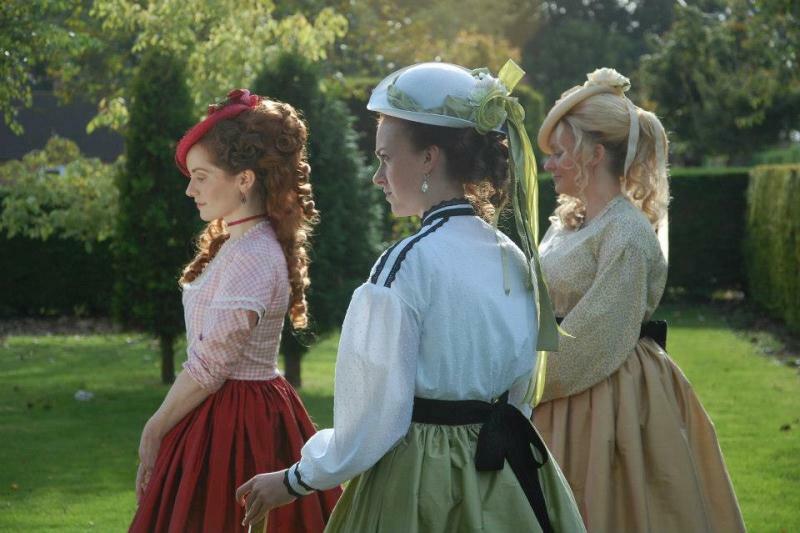 Victoria Turton-Blythe, Tiffany Haynes and Bryony Roberts as the ‘Roses’.